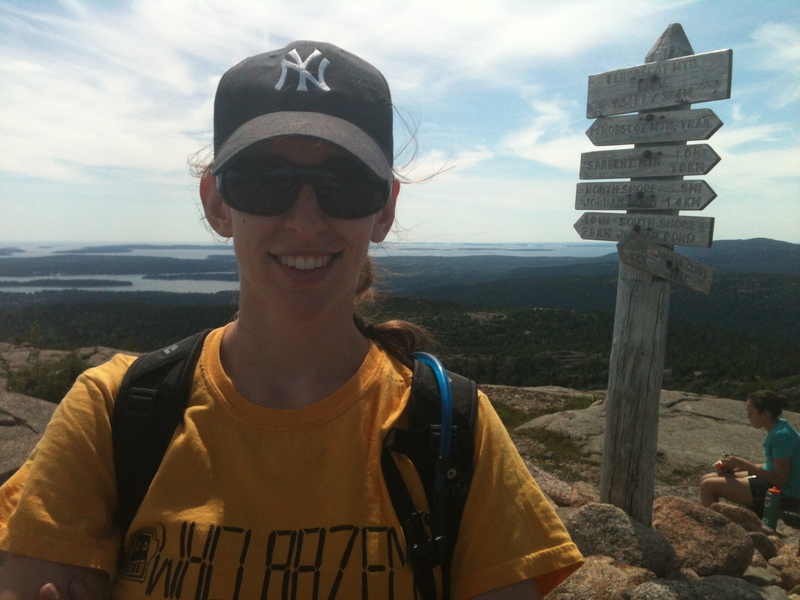 Wild blueberries, wild life and endless mosquito bites made up Jordan and my week in Acadia National Park. We hiked, biked, beached and boated during our time camping on Mt. Desert Island. We were staying on the ‘quiet side’ of the island, aka the western side, at the Seawall campgrounds. I was pleasantly surprised as to how clean the campsite bathrooms were – it was pretty unbelievable particularly thinking about how sequestration has affected our national parks. The view from the actual sea wall that everyone is forced to curve around on their way to the campsite was consistently breathtaking, in sunny or stormy weather. The quiet side of the island was less touristy and crowded than the Bar Harbor side. Although there were no bike lanes near our campground, the absence of cars on the road in the morning allowed us to take a lovely 10 mile bike loop (up many hills!) 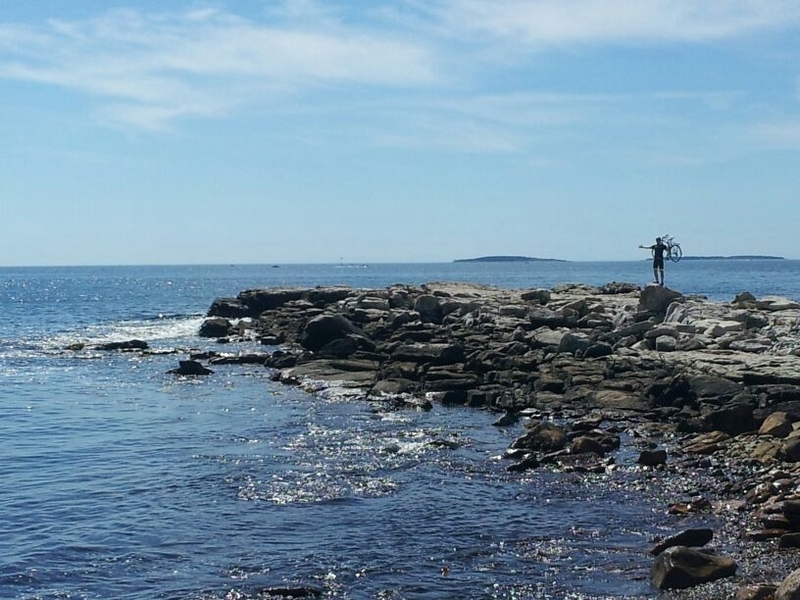 to explore the Seawall area and local seaside villages such as Bass Harbor. 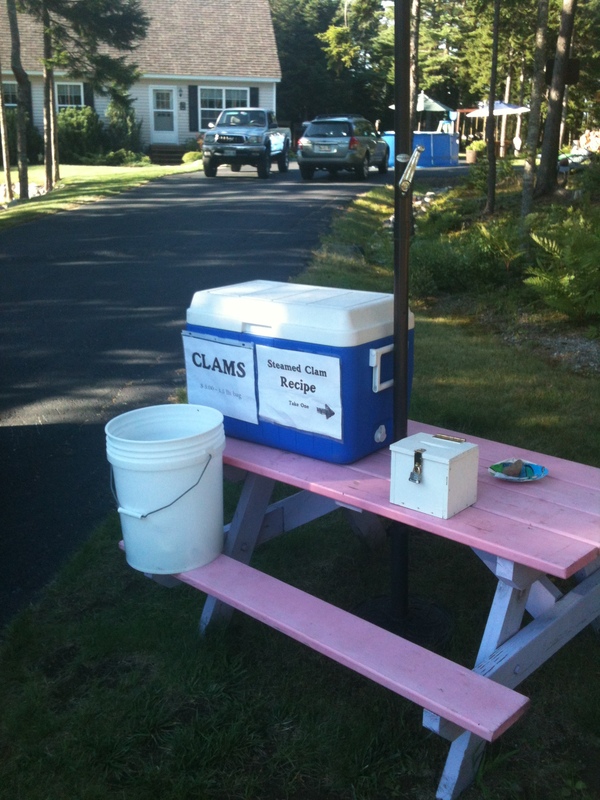 We took note of a hand painted ‘clams this way’ sign which is where we later bought some of the cheapest, freshest and cleanest steamers we’ve ever had for a gourmet campfire dinner! The steamers we purchased had been dug up that morning! 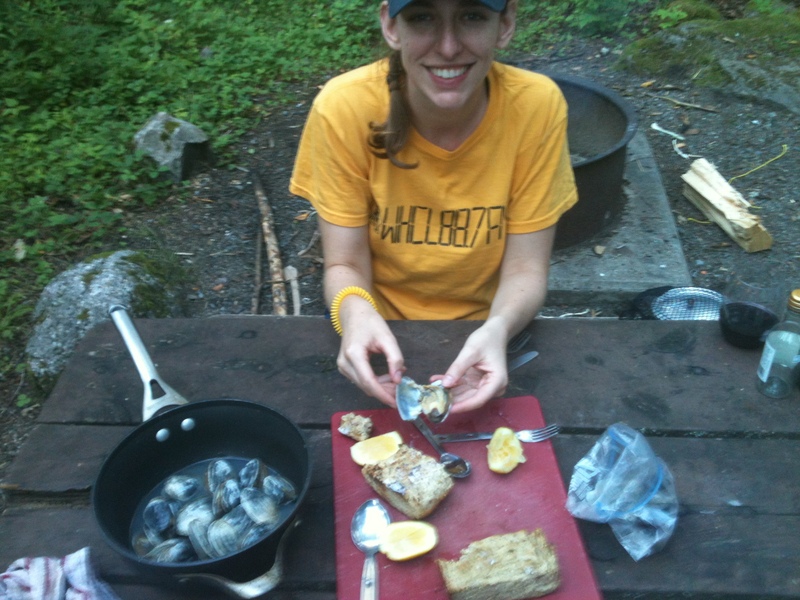 Jordan Cooking our steamers – who says you can’t eat clams with a white wine sauce in the woods? 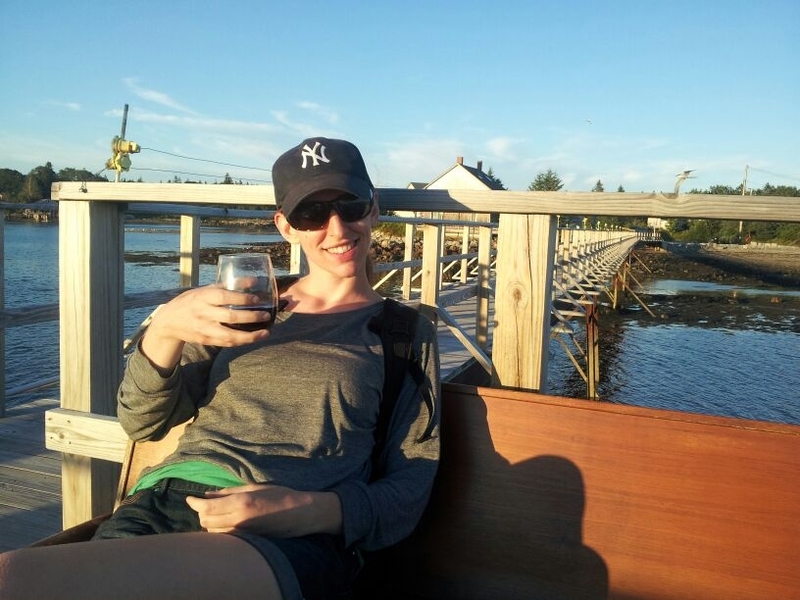 We also found an idyllic spot in Bass Harbor on what appeared to be a public pier to observe the sunset on our first night with a glass of the finest boxed wine sitting on the one fatefully placed bench at the tip of the pier. We sipped our wine surrounded by sea birds diving for dinner and sea lions floating lazily by as the sky went from purple to pink behind the old fashioned sail boats in the distance. A great start to the week! 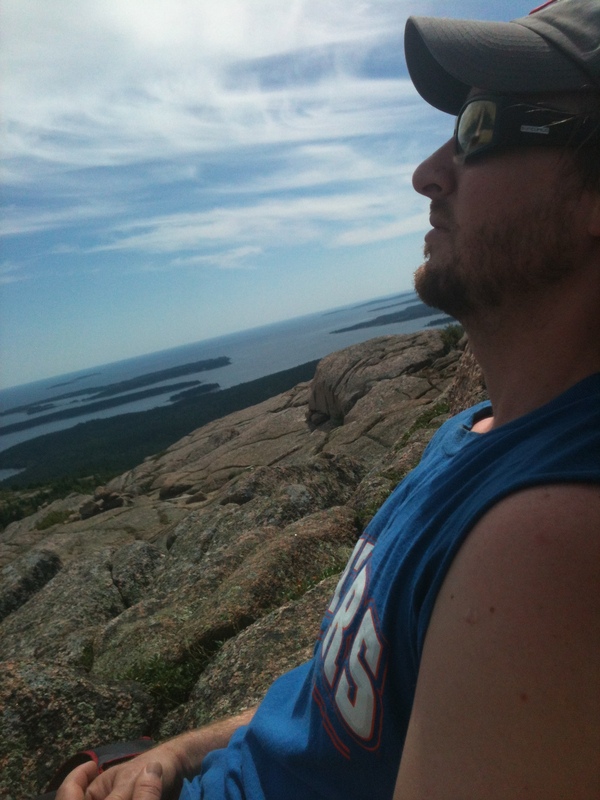 During the week we hiked up three peaks, Penobscot, Mansell and Bernard. 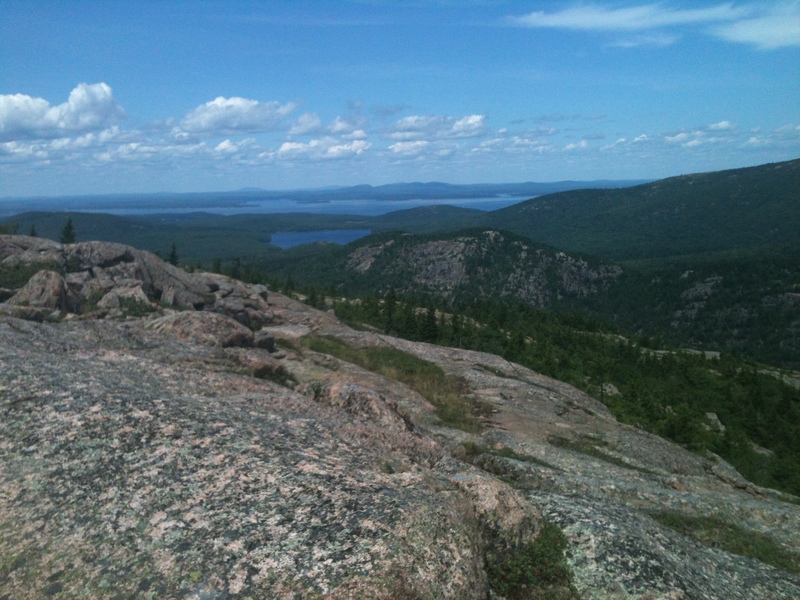 Although Penobscot was a bit crowded, the lack of tree cover during the final ascent of the mountain offered stunning views of Jordan’s pond, the porcupine islands and the harbor below. 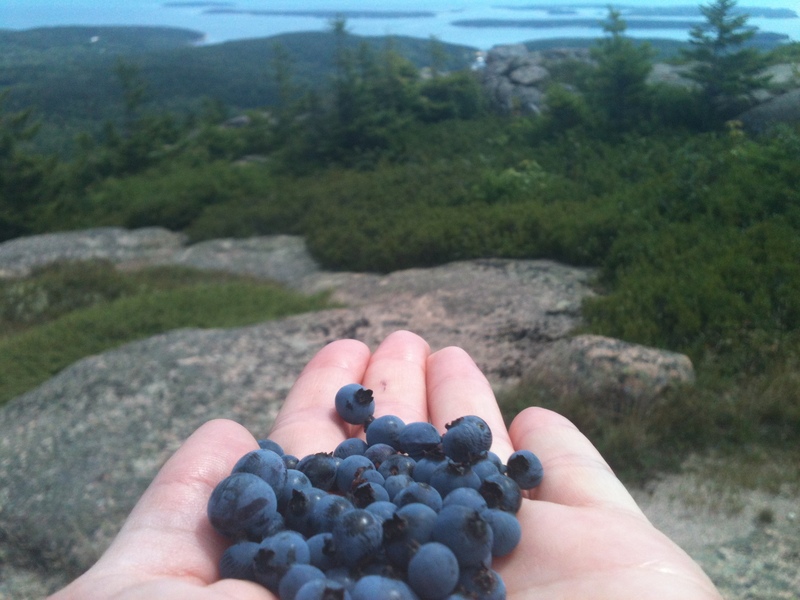 We were also able to leave our trail mix in our backpacks due the abundance of wild Maine blueberries growing all around the trail. I don’t think I’ll ever get over the magical feeling of happening upon wild, unclaimed fruit just ready for the eating – YUM! 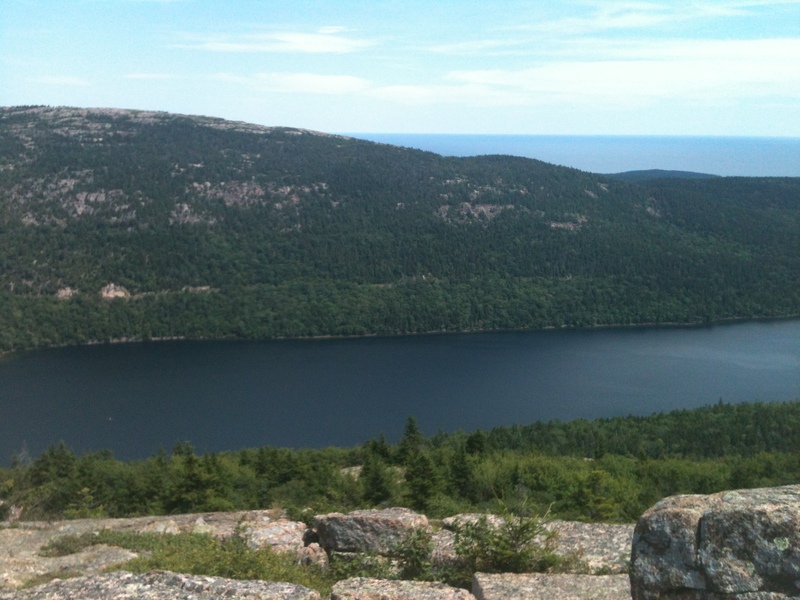 We decided to descend down the North West side of the mountain which took us down to Jordan’s pond. A leisurely walk half way around the lake from there was the Jordan’s Pond House – the famous popover restaurant within Acadia. Being a lover of all baked goods I had been dreaming of these popovers for a few days. 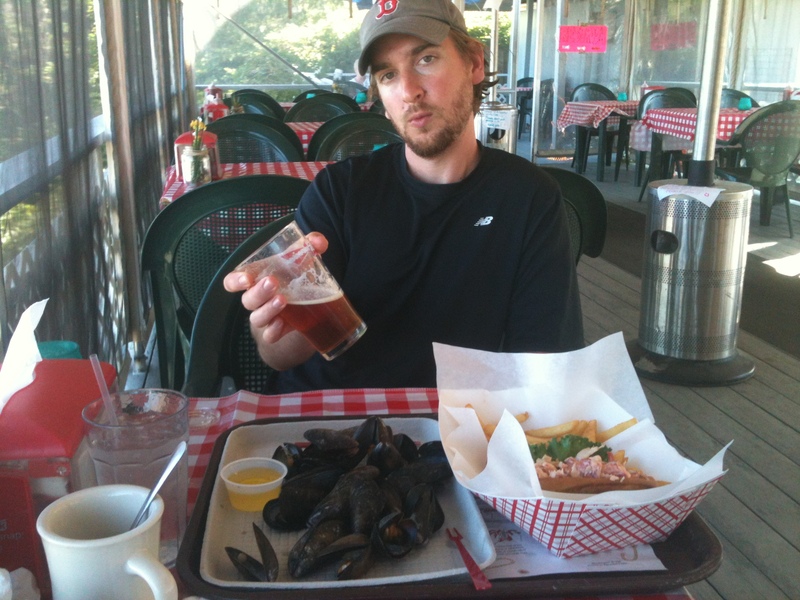 The restaurant was unpleasantly crowded and had a distinct stale and dated feel (similar to the feeling of Anthony’s by the Pier in its final years for any Bostonians out there). The place is also pretty overpriced, but we splurged for 3 popovers between us and savored every delicious bite! 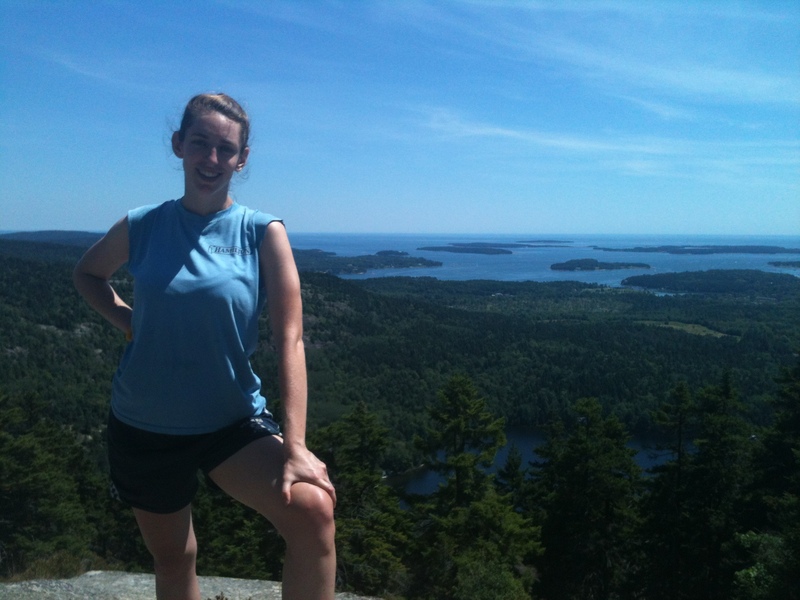 We next went for a dual peak hike to Bernard and then Mansell mountains on the western side of the island. 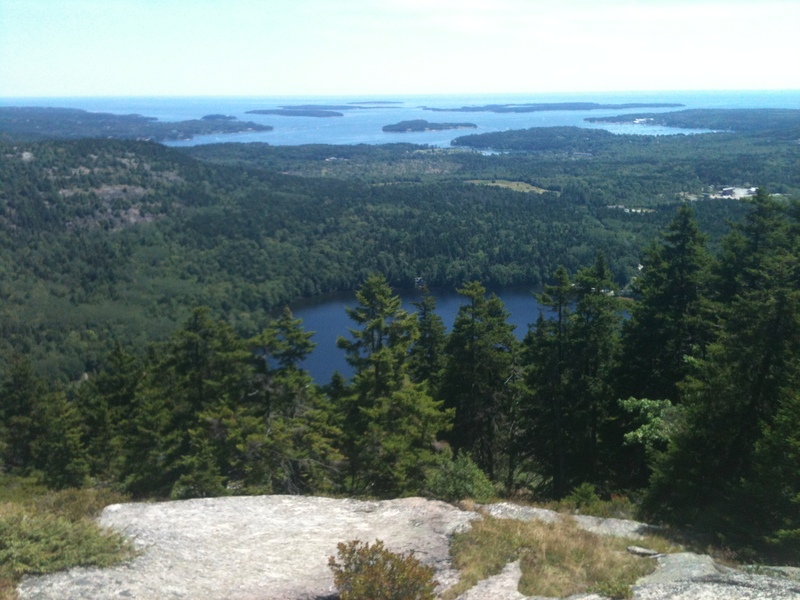 This came recommended to us by an experienced hiker we met on Penobscot who told us that barely anyone hiked these trails and we would get a quieter experience with great views. The trail head was at the pumping station for Long Pond. The hike started out in a shady forest with some pesky mosquitoes. I am kind of map obsessed and thus checked it compulsively on this hike since we could tell this trail and its markers did not receive as much upkeep and attention from the park rangers. Things were going along fine until the trees got thicker and thicker and the ‘trail’ became a stream. After a moment of panic (me, not Jordan) we easily backtracked, picked up the markers and continued on. The actual peaks of Mansell and Bernard offer no views and are surrounded by dense trees, sort of anti-climactic. However there are amazing lookouts very close to the peaks on your way up and down each peak which make the hike completely worthwhile. 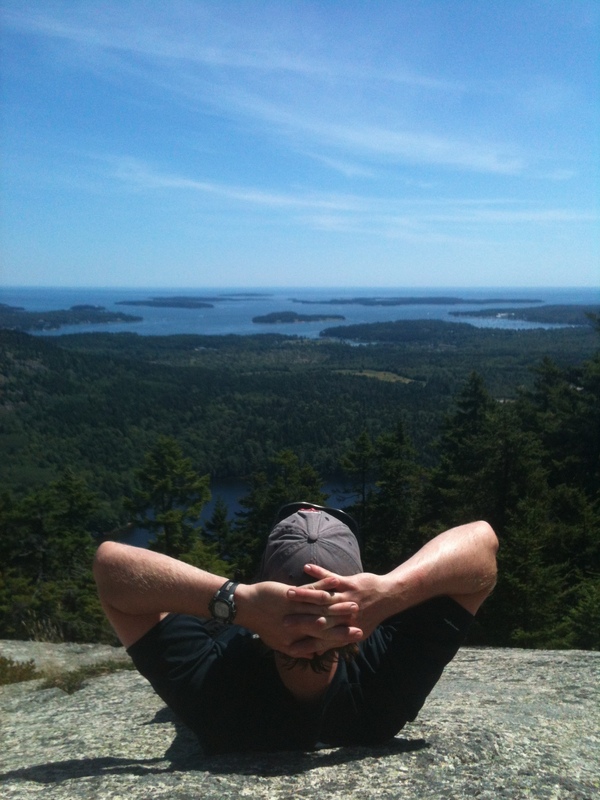 Our Acadia hikes can be summed up the by cool shade of the trees, the warmth of the rock faces at the peaks or lookout points and the electric clacking of the giant moths jumping around from rock to rock on the mountains. We had hoped to do more hiking but the weather did not cooperate with us for the last 2 days. In lieu of hiking we decided to venture over to Bar Harbor and take a sunset whale watching tour that was advertised in the Acadia weekly almanac (handed out by the rangers at our camp site). It was a cloudy day and the tour was expensive ($60 each) so we were extremely skeptical and worried that we were embarking on a potentially disappointing evening. On our way to Bar Harbor the road passed a range of mountains masked by low fog. It was such a stunning site so we pulled over at what appeared to be a lookout point, waded our way through tall grass and mud and got to take a good look. We thought this might be a good sign for the start of our evening. 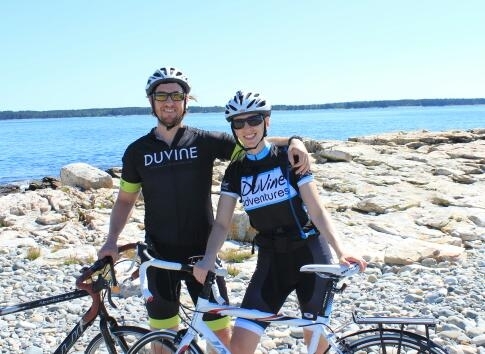 Although the coast of Bar Harbor was foggy, when we traveled the approximate 35 miles away from the coast on the motorized catamaran the weather was beautiful. Thank god we wore all our warm clothes because the boat goes quite fast and the wind off the ocean is cold! The tour was led by a naturalist who had decades of experience studying whales. The tour took us out to a known feeding ground, a point at which the ocean floor drops quickly to about 800 feet. Fish swimming from the 800ft depth are forced up to the surface as the ocean gets shallower and the whales capitalize on this for feeding. I scanned the horizon and could see numerous sprays of white water from the blow holes of the whales surrounding us. As the catamaran slowed down a humpback whale off in the distance breached and jumped completely out of the water and landed back with a big splash. It was a breathtaking site. But that was only the beginning of what felt like the best $60 I ever spent! Although the captain never purposefully got too close to the whales for their own protection, several times they surfaced right next to the boat. The naturalist explained the humpback whales follow a pattern in that they will surface about 3 times making small preliminary dips back into the water before their terminal dive which is when they surface a bit higher and their tail will completely emerge from the water, gracefully like a ballerina, before diving down deep. Once they get pretty deep they emit a large cloud of air bubbles from their blow hole which forces the schools of fish to rise to the surface. The whale follows the fish to the surface with its mouth open and traps them in his or her mouth. Brilliant! Once, one of the whales surfaced from the terminal dive head first mouth open RIGHT NEXT TO THE BOAT! Jordan and I were in the most perfect position to watch the whole encounter. The whales were truly awesome creatures that blew me away every time I caught a look at one. Some whales can live to be 200 years old (the naturalist told us) – imagine what they have seen! 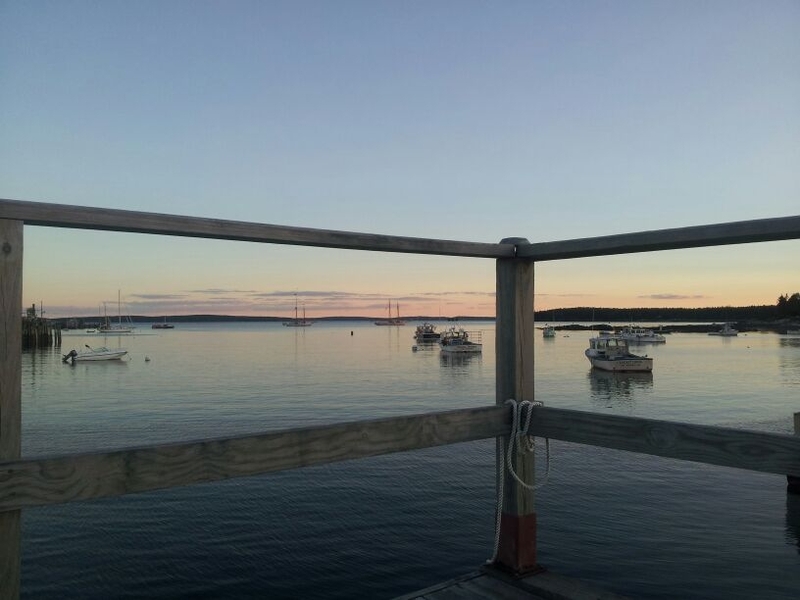 Despite the terrible hour of borderline seasickness I suffered on our return to Bar Harbor, it was one of the most incredible experiences I’ve ever had! This trip continued to fuel my desire to further explore America’s national parks. 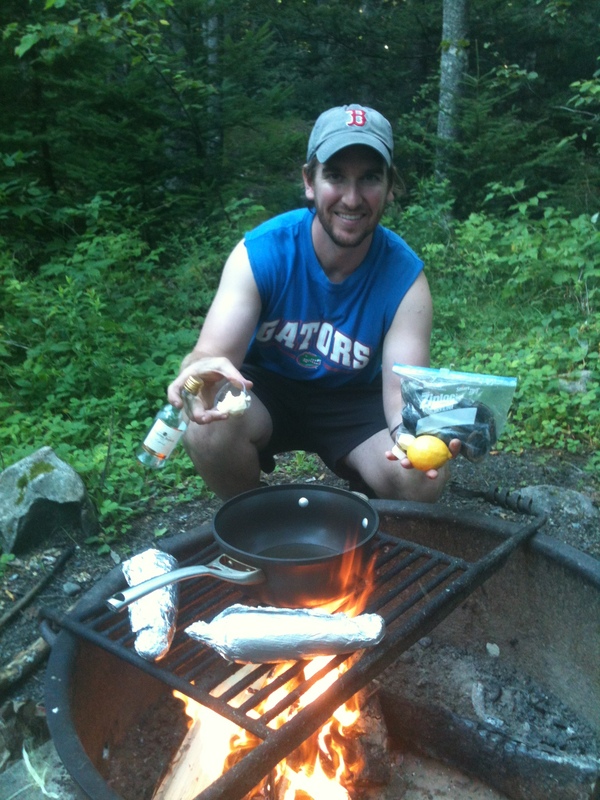 We had an incredible week at what I hope to the first of many trips to Acadia National Park! Lobster Roll #2 from Nemo’s on the quiet side of the island. 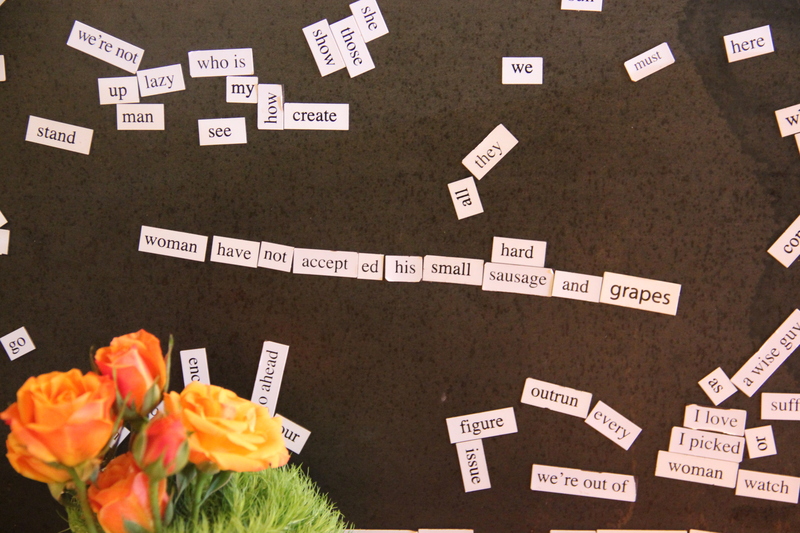 we thought this one was the best! 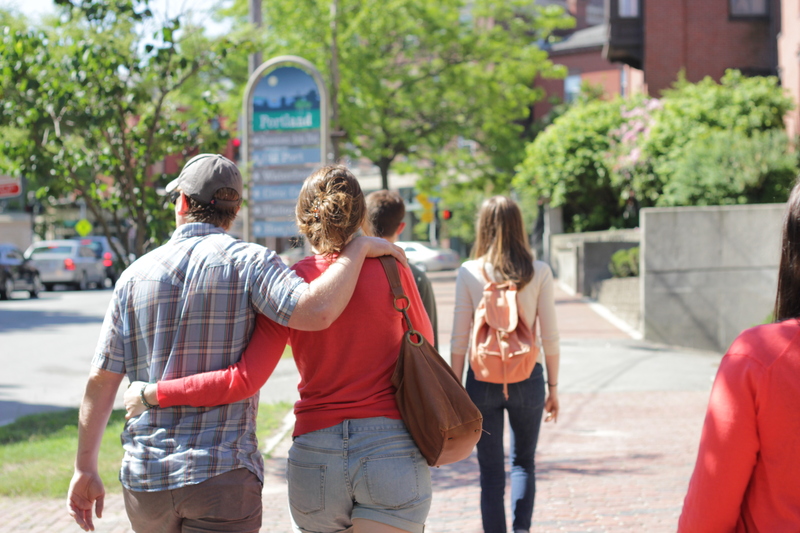 On a beautiful weekend in June I traveled up to Portland, ME with Jordan and four other friends from college. 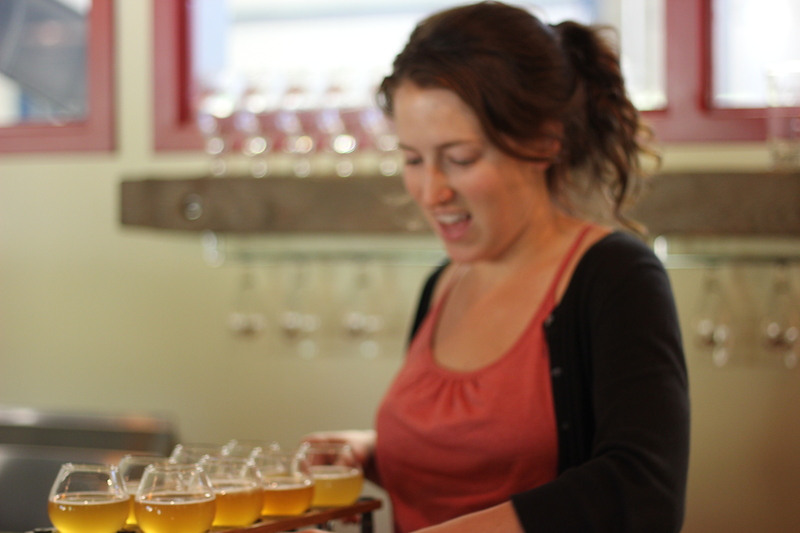 Another friend of ours just moved to Portland with her fiancé and started working at the Allagash Brewery so it seemed like perfect timing to take a trip! I have been to Portland a couple of times before for brief visits and have always had an epic time and this trip was no exception. Portland is a quick 2 hour drive from Boston. On this latest trip we were lucky enough to have a car but I’ve also taken a very affordable bus (Concord Coach Lines booked via Mega Bus). Additionally, for this trip we stuck to the major highway but if you have some extra time and a car you can take Route 1 instead. The scenic route 1 winds through the main streets of several adorable seaside towns and with the siren like sizzles and smells of many a fried clam shack settling in your stomach, be prepared to make frequent stops. We stayed at a wonderful Airbnb between the main downtown drag Congress Street and Deering Oaks Park. 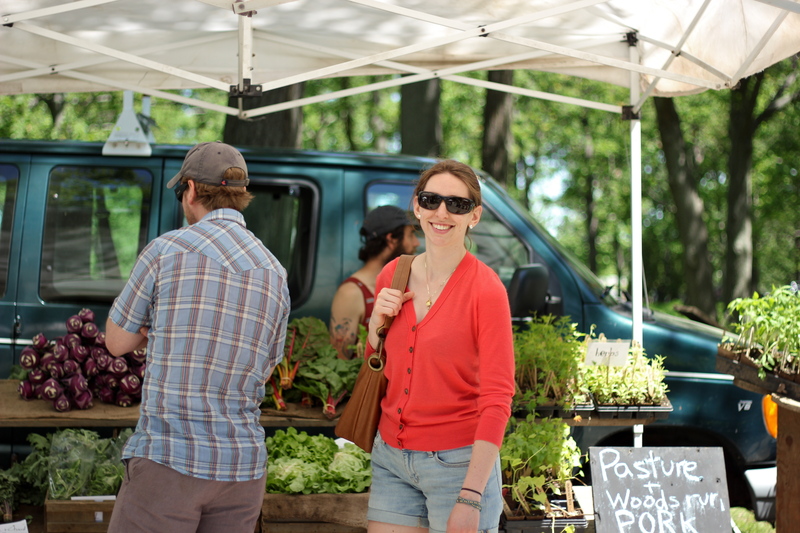 Each meal we went to in the city was outstanding and we were able to catch the Saturday farmers market in Deering Oaks Park! 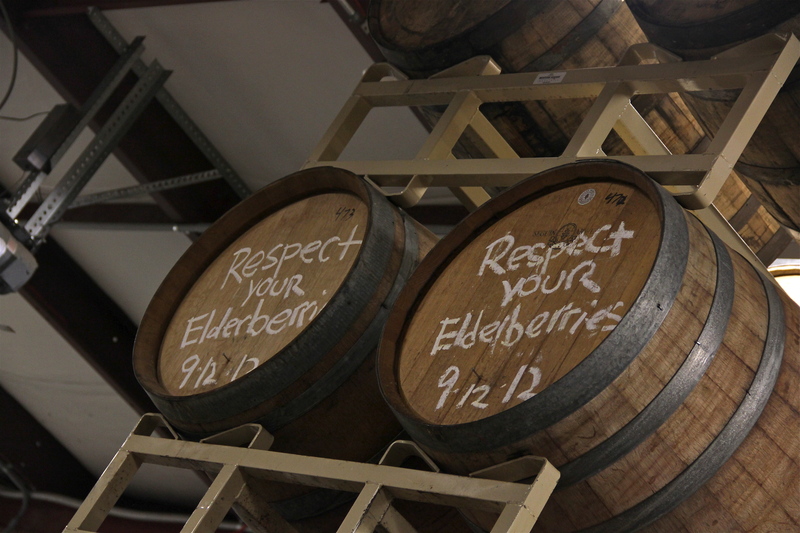 We had an UNBELIEVABLE tour at the Allagash brewery, complete with tasting flight. 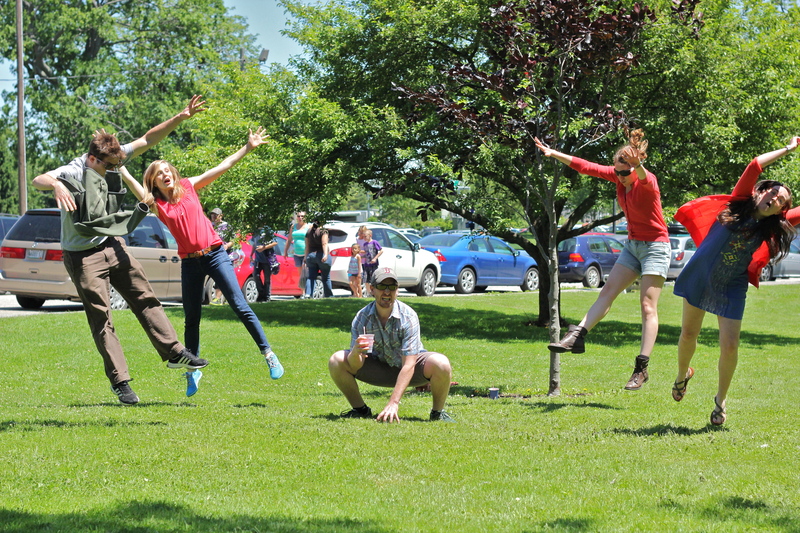 We even made a successful dragon ball attack photo! For details on where we ate see below. 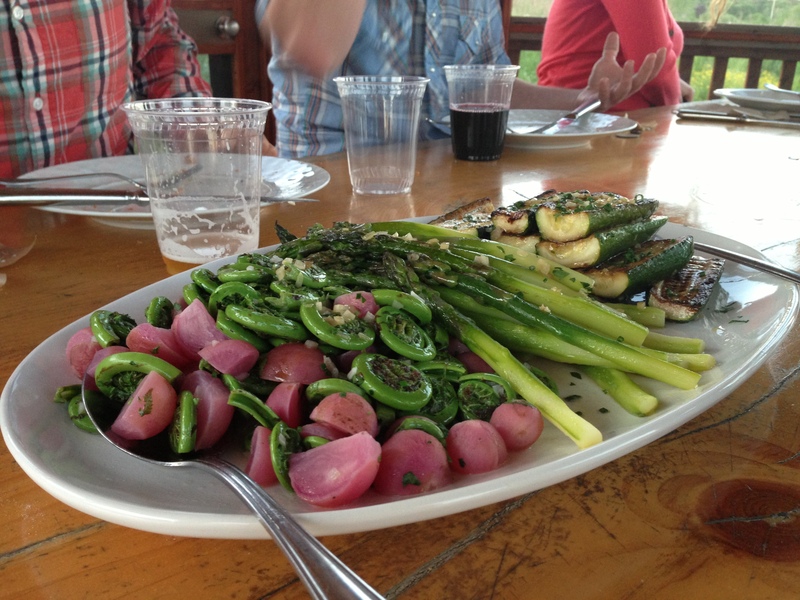 The best evening we had actually took place outside of Portland in Cape Elizabeth at a seasonal restaurant called “The Well” at Jordan’s Farm. 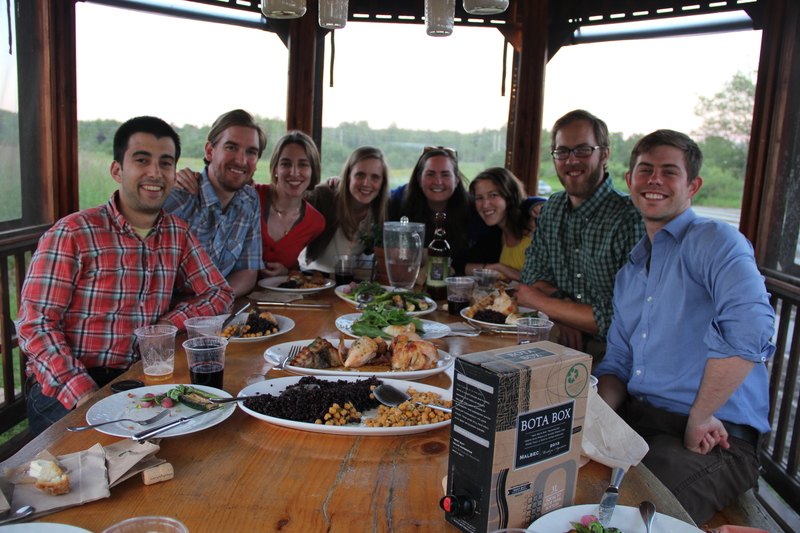 You’ve heard of farm to table type restaurants but at The Well your table is literally on the farm. There are a few picnic tables and two screened in gorgeous gazebos that contain solid, rustic, farmhouse style tables. Our gazebo fit our group of 8 comfortably. We chose the 3 course family style dining option for approximately $30 each. The place is BYOB so we were armed with some classy boxed wine and reinforced with an array of Allagash brews. In addition to the fresh air, sweeping farm-scapes and impending sunset seduction of the place, the chef sealed the deal with a constant flow of farm fresh veggies, black rice and pulses, the juiciest roasted chicken I’ve ever had in a restaurant, monk fish, pork belly, warm bread and a strawberry rhubarb crepe for dessert. Sitting out in the beautiful farm, full of good food and among such good friends engendered such a care-free happiness in me that just summed up the entire weekend! 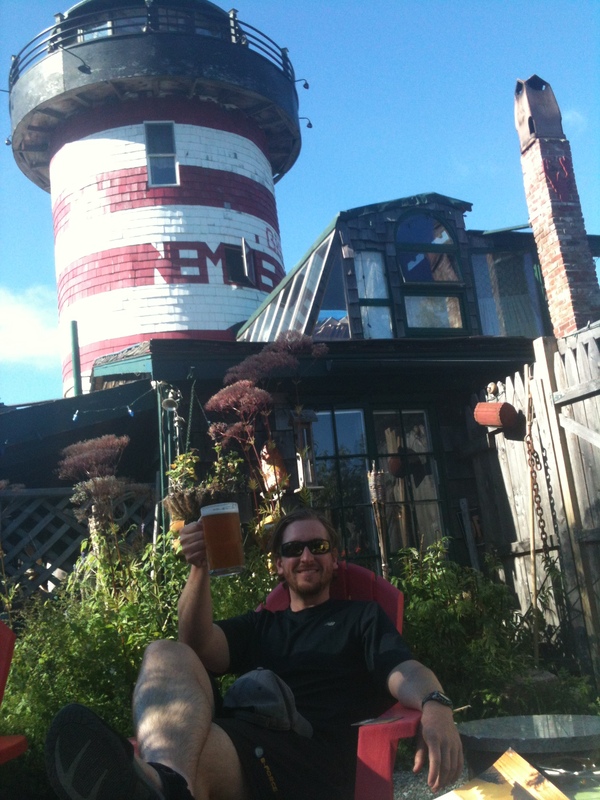 Enjoying our dinner at The Well at Jordan’s Farm in Cape Elizabeth, ME. 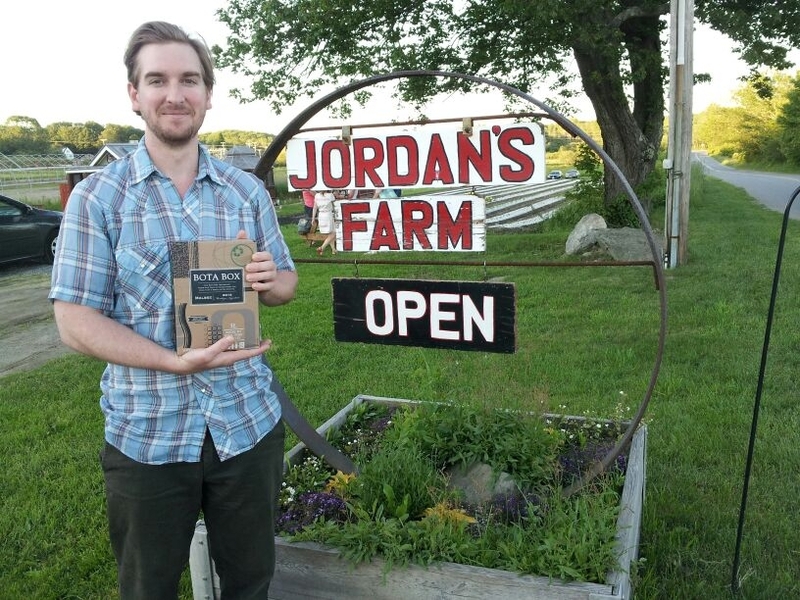 Jordan, at Jordan’s Farm! Cape Elizabeth, ME. That’ll do Portland, that’ll do. Boda – Thai Food (We had Dinner Here) – Everyone loved their food here – I ate the Beef Penang, which was tender and covered in a spicy but smooth sauce. 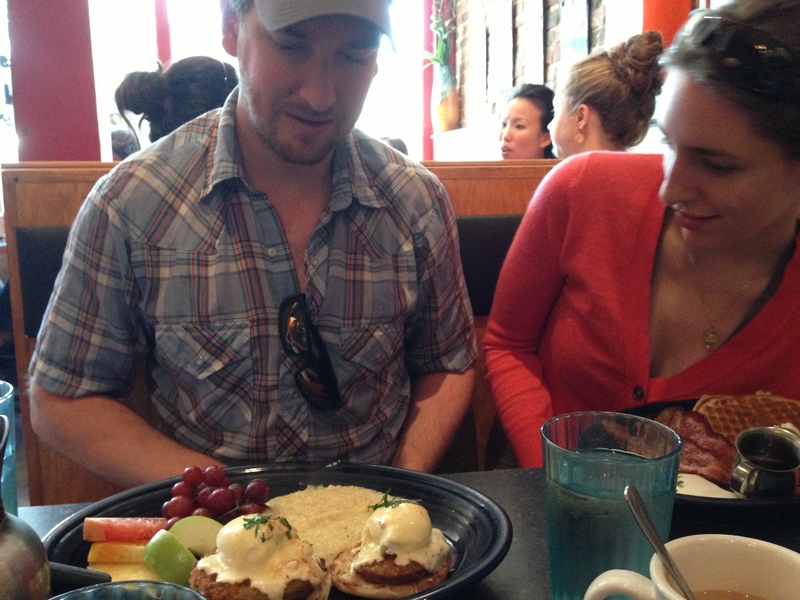 Hot Suppa – (We ate Brunch Here) – Coined “Bennies in June” on the weekend we were there, we were blown away by the Eggs Benedict with fried green tomatoes. THIS IS A MUST EAT! 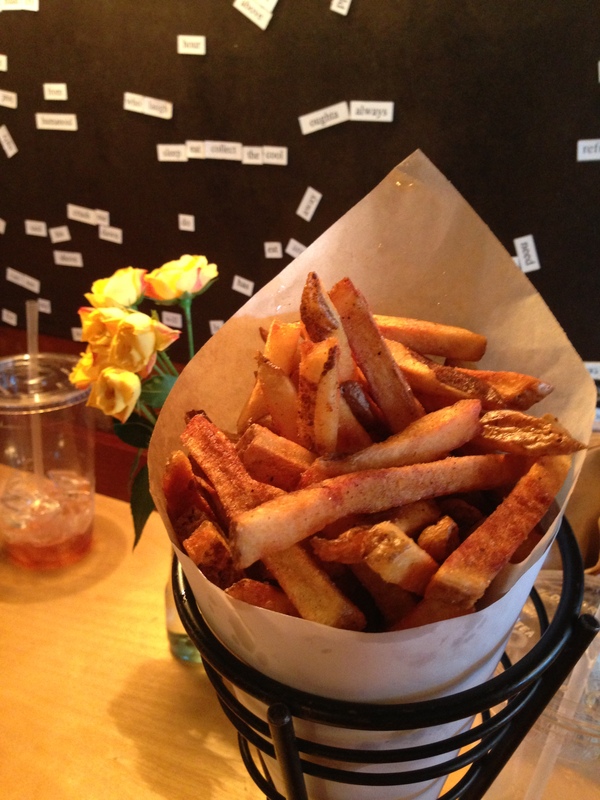 Duck Fat – (We stopped in for an afternoon snack) – French fries with truffle ketchup, horseradish mayo etc, beignets served hot and fresh, all fried in duck fat…need I say more??? 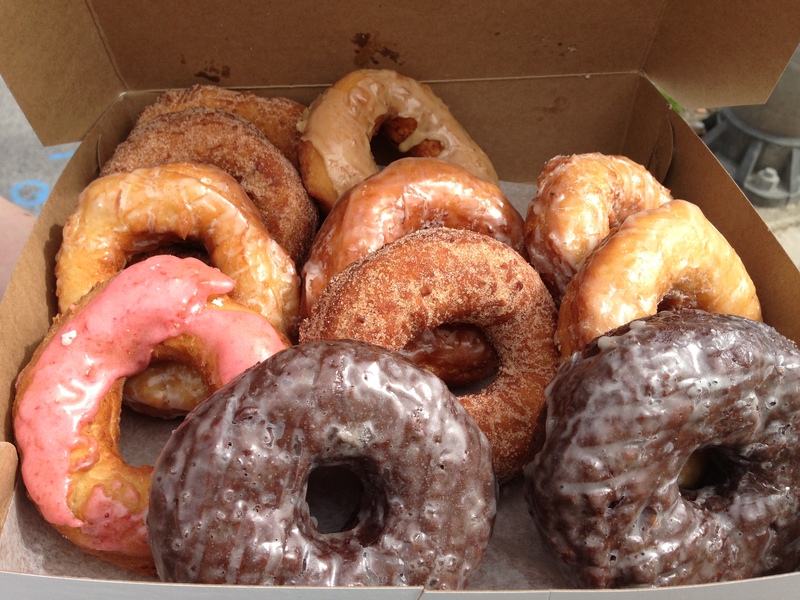 The Holy Doughnut – We bought a baker’s dozen of these hot beauties to add to the wonderful home cooked brunch Abby and Jeff treated us to.